Another great innovation in spurs! 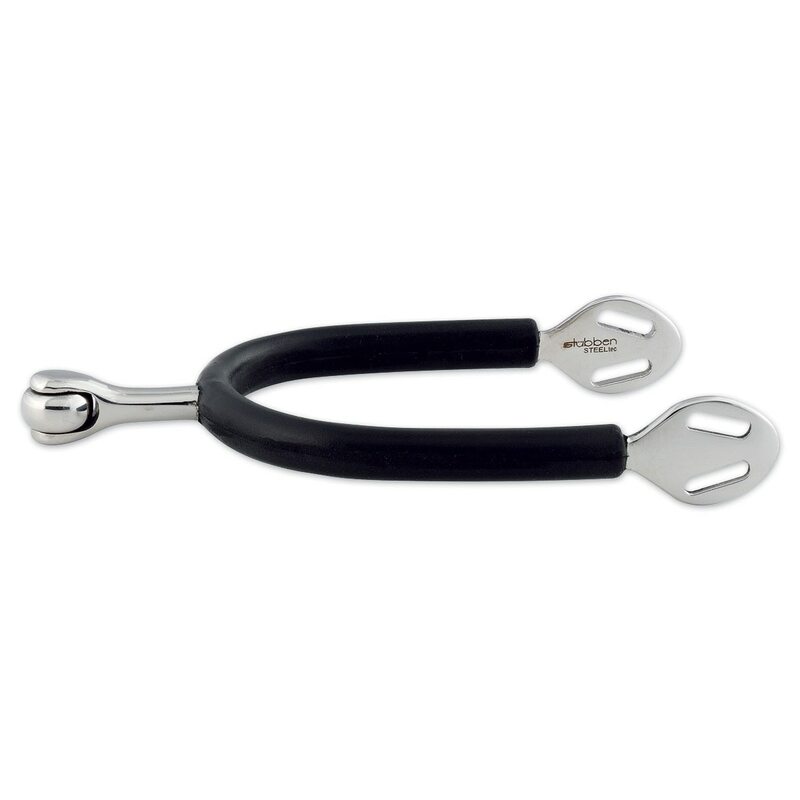 The Stubben Soft Touch spurs feature an extremely smooth gliding, stainless steel roller end! A perfect spur for the horse that just needs a slight encouragement. Imported. Stubben Soft Touch Spurs is rated 4.7 out of 5 by 55. Rated 5 out of 5 by Oliver from Great design. This spurs are superior to most because of the angle at which the straps attach. Rated 5 out of 5 by Halfhalt2006 from So far so good! I like the soft-touch spur - it works great with my gelding. I really like the rubber cover. It prevents the spur from slipping on my boots that don't have spur rests. Easy to bend into the desired size. Rated 5 out of 5 by Smacks1 from Handsome design. I bought these for my VERY sensitive QH APPENDIX. OMG. I can communicate leg yields with no drama. He stays relaxed the entire ride time because I do not have to nag constantly what I want. Thank you for a great spur. Rated 5 out of 5 by dca722 from Love these spurs! Gentle on your horse (especially if you're new to riding with spurs) but effective when used correctly - and no spur marks! They also look great with a black boot and fit nicely. Rated 5 out of 5 by ksweet724 from I have to buy these!!! My best friend loaned me her spurs one day because I didn't have mine with me. I fell in love immediately! My horse loves them and responds so much better and has no marks. I asked her where she got these spurs and she sent me to Smartpak. These spurs are the best!! Rated 5 out of 5 by Jenny from Perfect This fit my paddock boot perfectly! The rubber coating holds them in place. Rated 5 out of 5 by Katie from Great tool In all of my years of experience I've never had a reason to try rolling spurs, however, when my mare got marks during my ride with regular Spurs I thought I'd better give these a try. I'm so glad that I did! Not only does it not mark their sides but I also find that she is less over reactive when I do use them. Highly recommended , I now use them on almost every horse. Rated 5 out of 5 by Jenny L from Quality spurs I was having issues with metal spurs damaging my leather boots. Problem is solved with these spurs, and they stay in place nicely.